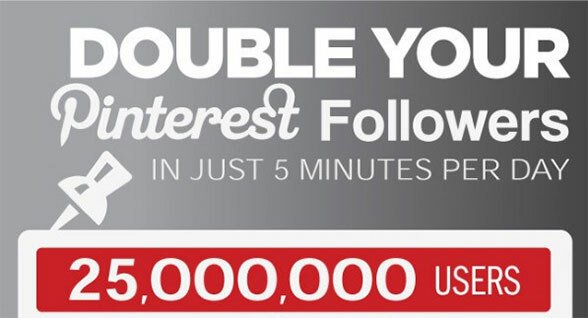 Recently WhoIsHostingThis created a very helpful infographic that summarizes how to double your Pinterest followers in just 5 minutes a day. The more you share and pin to your boards, the more you will get your name out there. Pin high quality images that are of interest to your target audience. Pinning colorful images is a good idea, as the more colorful they are, the more likely they are to be repinned. (Red, orange and brown images are two times more likely to be repinned than blue images.) Also, don’t hesitate to repin other people’s images – 80% of the images on Pinterest are repins and the more images you pin (or repin,) the more people will see that you’re valuable to follow! Go to the “Popular” feed and comment on the most popular pins 1-2 times per day (more than that can get your account suspended as a spammer.) Add value in those comments. Participate by contributing to group boards that have lots of followers, as the followers of those boards can become your followers as well. Follow those with similar interests, they will likely follow you back. Promote your most popular boards, instead of your entire account. That brings people who are specifically interested in that board’s content into your followership. Make sure your most popular boards are on the top row of your boards so potential followers can easily see them. Invite followers to contribute to your boards, so they will appear on their sites, increasing your exposure and keeping your boards fresh. Host a contest that requires people to follow you in order to enter. You can ask them to take action to enter, like follow you, share your contest, repin 20 of your pins, etc. to win the prize, but make sure your contest is proportional in size to the effort it takes to enter. Your contest image should contain your logo, a call to action, the words “contest” or “giveaway,” the contest end date and the prize. Then promote your contest in your newsletter and on social media. Use Pinterest’s analytics tool to find out what people are pinning from your site and create more of that type of content. Let your customers and contacts know about your Pinterest boards through signage in your window, including it on your business cards, including it in your advertising, events and marketing material and talk about it with your customers and contacts. What are YOU doing to promote your Pinterest boards? Share it by commenting below, and don’t forget to +1, Like, Share, Tweet and Pin this post!